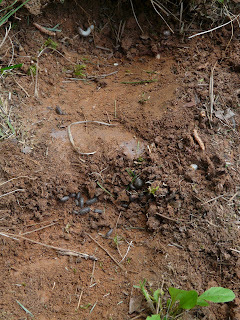 I went out to dig an area for my new veggie plot, and got one scoop full of traditional gardening pests. There were about twenty rolly pollies, two grubs, and three snails, all under one scoop! It's pretty great that we're finally getting BUGS in the yard. This is the first year that I've seen worms everytime I've dug, and really any sort of bugs that eat organic matter. Usually, we have a plethora of sucking insects, but they haven't made an appearance yet, unlike the past couple of years. I'm very pleased with how well the land is doing since I've moved in. Apparently, spreading compost throughout the lawn, adding beds, mulching and amending them, adding plants, mulching leaves and grass in place, and not using pesticides and chemical fertilizers is a way to successfully keep a garden growing. That pleases me immensely.